Sri City, June 22, 2016:- Syndicate bank launched its branch in Sri City on Wednesday with well-equipped facilities. 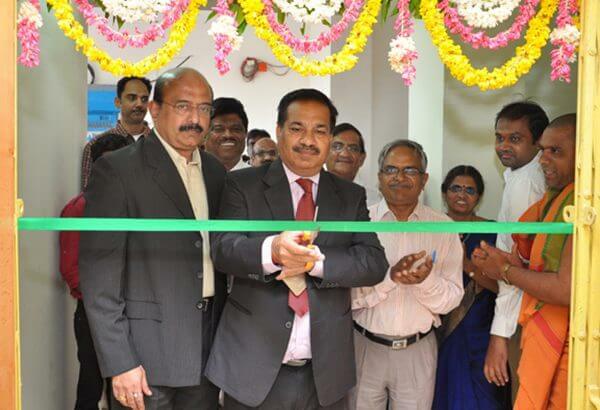 The branch was inaugurated by Mr. R. Nagarajan, Chief Financial Officer, Sri City in the presence of Mr. S.P. Sharma, General Manager, FGMO, Syndicate Bank, Hyderabad, Mr. T. Srikrishna, Regional Manager, and Mr. B. Pavankumar, Branch Manager, Syndicate Bank, Nellore. Commenting on the occasion Mr. Ravindra Sannareddy, Founder Managing Director, Sri City said that Syndicare Bank is the third bank in Sri City and this speaks of the priority and importance that the banks give to Sri City. “Besides the SBI and the ICICI bank, I am sure the presence of Syndicate Bank will greatly improve the banking services to the industrues and the public, and further enhance the economy of region, ” he added. Speaking on the occasion, Mr. Sharma assured that the bank will provide the best of the facility and services to the customer, particularly to the industries. In addition to the normal transactions, he said, bank will give loans and over drafts.